A long time ago, we bought a big old brick building in the village, because we had gotten a boat, and needed a place to store it. Since it was on a side street within one block of downtown, we eventually started calling it our “Town Barn.” Originally, the building was built for a church. After it was no longer used as a church, the building was used as a place to pluck chickens, as well as selling eggs and cream there, too. History has it that 2 fellows invented the “Chicken Plucker” in that very building. It was later being used for storage, so we bought it for place to store our boat. Back in those days, when we were a lot younger, we thought it would be a lot of fun to learn to water ski. So we took the boat over to the Delaware Dam area. The water wasn’t very cold in the summer, so with a lot of practice, I could get in the water, ski around to my heart’s content, drop the line, get back in the boat, and never get my hair wet. After several years of enjoying skiing, we bought our farm. With all the work to be done at the farm, there was no longer time for skiing, so we sold the boat. With the boat no longer taking up space in the town barn, more and more stuff accumulated to take its place. We let a couple of people use it for their yard sale. However, when their sale was over, they left the stuff there that didn’t sell, and they never did come back to get it. So, after a lot more years of accumulating more stuff nobody wanted, we knew it was time to clean it out. Where do you begin to clean out a barn that’s full of things that are of no value to you any longer? (This was a long time before we ever saw the TV show “American Pickers.”) A lot of this old stuff was never originally ours in the first place. A lot of people we knew just wanted someplace to put things they wanted to get rid of. For instance, big old overstuffed chairs, as well as old broken down bikes that needed a lot of repair. Also, a lot of broken windows that had a few panes of good glass left. And, a lot more stuff that comes under the heading of “too numerous to mention.” The only thing that interested me was my mother’s buffet. To anyone else, it was just the average everyday buffet. (Two big drawers in the center, with doors that opened in the front at each end.) But, this particular buffet had been in every dining room of every house I had ever lived in during my growing up years. We can’t remember how it ended up in our town barn, but there it was, in need of a lot of work to fix it up. I don’t know where we got the idea to give everything away, but that’s what happened. I made a big sign with just one word on it, “FREE,” and put it out front. George moved a lot of the interesting stuff outside, got a lawn chair, and took up residence in front of the town barn to see what would happen. Immediately, people stopped to see what was going on. After all, the sign said “FREE.” One of the first persons to stop was a guy who was glad to find that we had a lot of chairs he could fix up, since he did reupholstering. When we gave him all seven of them, he was one happy guy. Another man wanted all the panes of glass because his wife wanted him to build a greenhouse in their back yard. Another was a kid named Jamie, who wanted all the broken bikes. The “give-away” was held on a Saturday and Sunday, several summers ago. Spending all weekend over there felt like we were on some weird type of vacation. Everyone was happy to get what they wanted and we were happy to get rid of it. As evening came on the second day, we were almost completely cleaned out, except for the buffet. A young man showed up and said he would like to have it and would refinish it to look just like new. I was undecided about letting it go, but he convinced me that I should let him have it, because when he was finished, he would take a picture of it and bring it back for me to see. Well, if that same young man is out there, reading this article, I am still waiting to have you bring me that picture of Mom’s buffet, as promised. It would do my heart good to see it in its original beauty again. Soon after our big giveaway, a neighbor said he wanted to buy the town barn, so we sold it to him. We still talk a lot about the days when we were very young and the type of life we lived back then, including our summers of skiing at the Delaware Dam. Now, when I walk past the “town barn,” I see the bricks are beginning to disintegrate. I remember the problems we had with kids throwing rocks and breaking the windows. (That’s where all the broken windows came from.) I haven’t ever been inside again, but something tells me it might need another cleaning out in the near future. I don’t remember what we did with the “FREE” sign, but maybe it’s still in the barn and would come in handy if the new owner wants to use it. 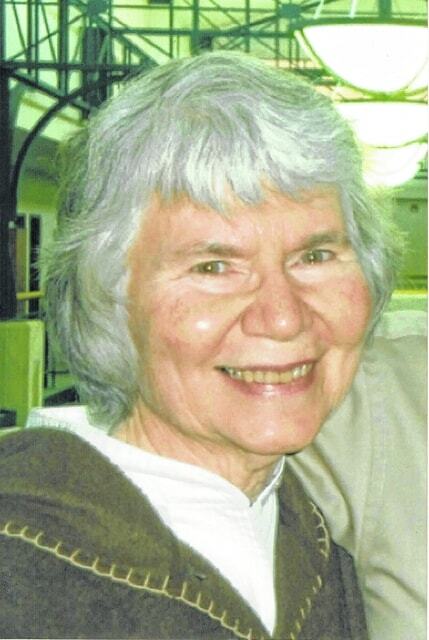 Kay E. Conklin is a retired Delaware County recorder who served four terms. She graduated from Ohio Wesleyan University with a degree in sociology and anthropology. This entry was tagged delaware, ohio. Bookmark the permalink.